Class Warfare – Ortho Follow-up Style. This paper is glimpse into the sad realities brought about by the class warfare unveiled by the current US public/private insurance system. They looked at all 102 Dallas-Fort Worth orthopaedic groups. All groups were called twice from a patient discharged from the ED with an ankle fracture who utilized a standardized script- one call saying they were uninsured, another saying they had either private insurance or medicaid. All in all, 204 calls were made (59 private, 43 medicaid, 102 uninsured). Controlling for paired calls to same practice, an uninsured caller had almost a 6x higher rate of follow up than medicaid callers. Also despicable is that the uninsured had to bring a median of $350 to their first appointment (less than 2% were asked to bring $100 or less) – or, 48% more than the usual total payment collection from a privately insured patient ($236), and 273% more than the usual payment collected from medicaid ($128). Want more heinous activity? 48% of uninsured patients were directed to the ED when they asked where they could go. Less than 10% of medicaid patients were able to secure an appointment with ortho practices that were on medicaid’s list of providers accepting new patients! Either their database needs updating, or the practices are outright lying. Given the difference in payments between the uninsured, private patients, and medicaid patients, I suspect the problems lay on the side of the individual practices. Emergency Medicine- the front lines and safety net. Platelet Rich Plasma… in the ED? For an ankle??? This was a prospective, randomized, double-blinded, placebo-controlled trial – THAT INVOLVED INJECTIONS INTO AN ANKLE FOR AN ANKLE SPRAIN. The kind me and you do, oh, I dont know, at least 2-3 times a year. And manage to do just fine. But this was not just any injection, but platelet rich plasma. Which just does not sound cheap, and sounds like terrible indication creep if I’ve ever heard it. After 37 patients were randomized to placebo or platelet rich plasma intra-articular injections, both groups had were evaluated for their visual analog scale (VAS) pain scores and Lower Extremity Functional Scale (LEFS) on days 0, 3, and 8. LEFS and a numeric pain score were obtained via phone call on day 30. All participants were splinted, given crutches, and instructed to not bear weight for 3 days; at which time patients were reevaluated. This seems like a colossal waste of time, money, and resources. Perhaps they were really testing to see if they could find 37 patients silly enough to accept an intra-articular injection for a low risk injury, then have a splint placed (I wont get into my thoughts on placing a splint for injuries like this, instead I’ll refer you to here and here). Then again, if we continue to provide patients with other sham procedures despite evidence that demonstrates their are useless, then perhaps ED platelet rich injections are merely the next evolutionary step after back surgery and knee arthroscopies. Paging Dr Buckle, Part Two. We can add two more pieces of literature to suggest that removable splinting alone is sufficient for the management of distal forearm torus fractures. 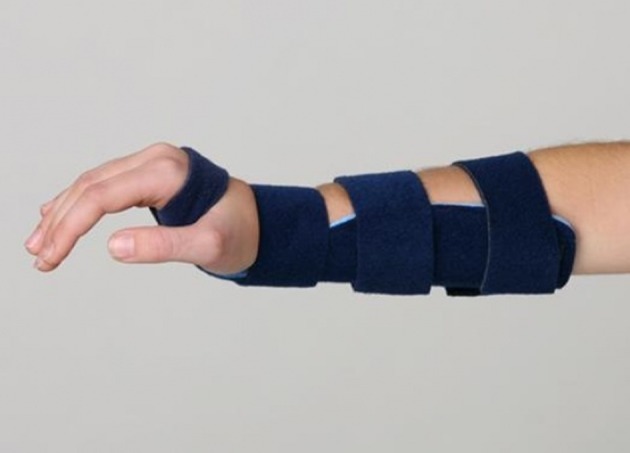 This piece looked at 142 pediatric patients randomized to short arm cast or removable wrist splint for 3 weeks without a significant difference in pain, compliance, or complications. Then there is this article that looked at 119 consecutive pediatric torus fractures over a one year period seen by an APRN who were immobilized with a soft cast. There were no adverse events, and no subsequent visit to fracture clinic. In comparison to previous standards of fracture clinic referral, there was a cost savings of $18596 euro (20k USD) in total. The AAOS says, “The use of removable splints is an option when treating minimally displaced distal radius fractures.” Since this 2009 recommendation, there are now 5 publications (the two articles above, plus three from this previous post suggesting nondisplaced pediatric Torus fractures can be safely treated with a removable splint at a significant cost savings to all involved. Less paperwork, equal efficacy with shoulder blocks. Raise your hand if setting up conscious sedation is a small act of God in your ED. Glad to see you’re all still here. Now, lets talk about how we can reduce that paperwork, and make the best use of nursing & clinician time in a busy ED. The June AJEM issue compares suprascapular blocks (21 patients) to Ketamine procedural sedation (20 patients) for shoulder dislocations. There was no difference in success or patient/physician satisfaction. Time spent in the ED was significantly longer in the sedation group, and side effects were not observed in either group. Previous studies looking at intra-articular lidocaine vs conscious sedation (here, here, and here) also showed a decreased LOS without a difference in satisfaction, pain control, or efficacy. Shoulder blocks and intra-articular have great efficacy in all the studies I was able to find, all showing excellent pain control and improved LOS. The caveat is this study which shows that if a patient has had conscious sedation for a shoulder reduction in the past, they would prefer conscious sedation over a block. You can review how to do an intra-articular block on YouTube thanks to Mike Stone and Academic Life in EM. Let’s face it, you went into Emergency Medicine for the glory, not for the twisted ankles/FOOSHes. But you went into medicine to help people, so let’s start (and finish) there. Even for the bread and butter EM / Urgent Care ankle/wrist sprains (and straight forward, uncomplicated, non-displaced distal fibula/radius fractures!) you can help people! Simply by *NOT* placing a splint. Ability to bear weight at 48 hrs? 56.6% vs 42%, Aircast vs splint for ankles. Normal activity at 2 weeks for wrist buckle fractures? 95% vs 67% in favor for Aircast. Function at 1, 2, 3, & 4 months? All better in Aircast. Comfort at 24 hrs? Swelling? Better with Aircast. Return to work sooner? Go Aircast. The high school athlete wants nothing more than to get back on the field sooner. Why not help them by not placing them in a splint? You’ll increase comfort, ability to bear weight at 48 hours, and improve their chances at normal function at 1, 2, 3, and 4 months. For what its worth, there is somewhat less data, but a similar trend for pediatric wrists (ie, buckle fractures) to have less pain and a sooner resumption to normal function. For fractures, I’d make sure ortho is on the same page, but for the number of ankle/wrist sprains/breaks you see in a day in an ED, you can probably make a measurable difference for the better every single day by not splinting.